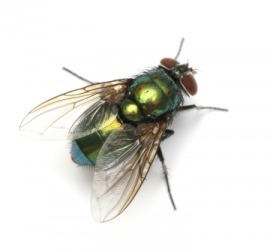 A fly is one type of insect. The definition of an insect is a bug- a small anthropoid with six legs and, sometimes, wings. An ant is an example of an insect. "insect." YourDictionary, n.d. Web. 19 April 2019. <https://www.yourdictionary.com/Insect>. a. Any of numerous arthropod animals of the class Insecta, having an adult stage characterized by three pairs of legs and a body segmented into head, thorax, and abdomen and usually having one or two pairs of wings. Insects include the flies, crickets, mosquitoes, beetles, butterflies, and bees. b. Any of various other small, chiefly arthropod animals, such as spiders, centipedes, or ticks, usually having many legs. Not in scientific use. An insignificant or contemptible person. Latin īnsectum from neuter past participle of īnsecāre to cut up ( translation of Greek entomon segmented, cut up, insect ) in- in ; see in- 2. secāre to cut ; see sek- in Indo-European roots. Any of very numerous, mostly small arthropods of the class Insecta, having six segmented legs in the adult stage and a body divided into three parts (the head, thorax, and abdomen). The head has a pair of antennae and the thorax usually has one or two pairs of wings. Most insects undergo substantial change in form during development from the young to the adult stage. More than 800,000 species are known, most of them beetles. Other insects include flies, bees, ants, grasshoppers, butterflies, cockroaches, aphids, and silverfish. A contemptible or powerless person. From Middle French insecte, from Latin insectum (“with a notched or divided body, cut up”), from perfect passive partciple of insecō (“I cut up”), from in- + secō (“I cut”), from the notion that the insect's body is "cut into" three sections. Calque of Ancient Greek ἔντομον (entomon, “insect”), from ἔντομος (entomos, “cut into pieces”). Any of numerous arthropod animals of the class Insecta, having an adult stage characterized by three pairs of legs and a body segmented into head, thorax, and abdomen and usually having one or two pairs of wings. Insects include the flies, crickets, mosquitoes, beetles, butterflies, and bees. Any of various other small, chiefly arthropod animals, such as spiders, centipedes, or ticks, usually having many legs. Not in scientific use. A boot came down on the angry insect before it could reach her. The fertile leaves or sporophylls are generally aggregated on special shoots to form rioweN which may contain one or both kinds The microspores are set free from the sporangiurn and carried generally by wind or insect agency to the vicinity of the macrospore, which never leaves the ovule. If in extracting the insect the abdomen be ruptured, serious trouble may ensue from the resulting inflammation.